this past weekend, the whole family bustled down to auburn, al to celebrate clark’s graduation with his master of accountancy from the raymond j. harbert college of business. he’s spent the last five years as a tiger, passing his classes with flying colors and even acing his cpa exams. such a smarty pants! we are incredibly proud of him, and me? i’m even more excited because he’ll be moving in with me next month! yay, roomie! all three kids of us in one city? oh, the magic! pictures were a must, so we busted out the cameras and retreated inside the school building to escape the humidity. it could have been much warmer out, but hey, it’s still summer in the south, so you know it’s going to be hot. after snapping our dozens of photos, we had a little bit of time before the ceremony started. we strolled on over to momma goldberg’s deli for a quick snack, and it was a fantastic idea. clark has loved momma g’s as long as i can remember, and i first tried it when they finally built one up in birmingham. the sandwiches are just the right size, not too heavy. but what is it that makes this place so famous? i’d say it’s the momma’s nachos. 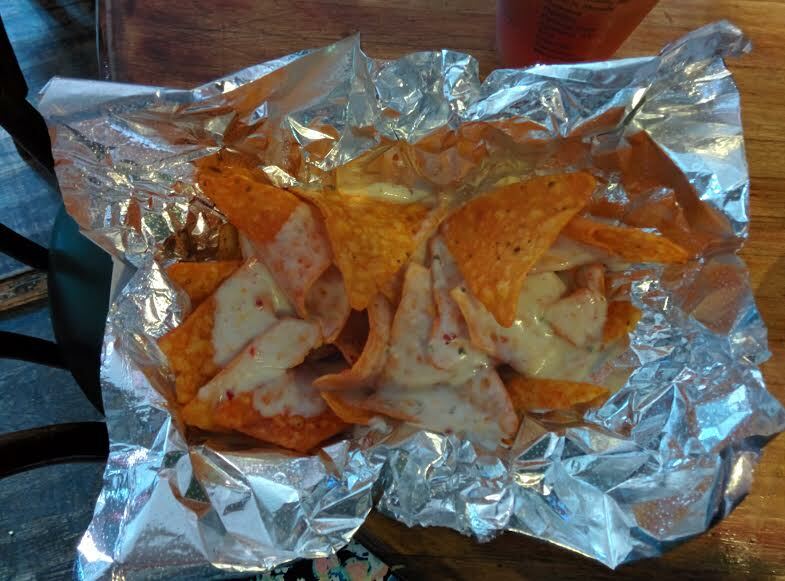 they are doritos chips covered in pepper jack cheese and jalapeno peppers. oooooh, yes. i know you’re drooling like i am. it’s easy to eat a whole basket of them yourself! a couple hours later, we were applauding and hugging and congratulating clark upon his final graduation…at least for now! we’re just so darn proud of him. to celebrate, we dined at acre off glenn avenue and had a fabulous dinner together. see just how fabulous we thought it was! after dinner mom and dad hopped in the hyundai and headed back home. as for us kids? we were ready for the rest of the night! we needed to keep this fun going. but first? first we needed to recharge at the hotel before wrecking havoc around town. the hilton garden inn was quite accommodating, and after a quick nap, we washed up, called up that tiger taxi, and headed to downtown auburn. our one and only stop that night was a place i’d heard stories of, a place that i’ve heard is so much fun, you have to go there when you are visiting. of which place do i speak? skybar. yes, ladies and gentlemen, we went to skybar and had a stellar time. the weather was cool and comfortable, the drinks were cheap and strong, and the place wasn’t too rowdy. it was actually quite relaxing as we lounged in the chairs on the upper patio. kari, terrified of what might lie ahead! after enough people watching, clark took us on a tour of the rest of skybar. we weaved through the hallways and dumped right into the boom boom room. now, this room of skybar is infamous, as in it is a place where folks get sloppy and more intoxicated as the night goes on. i was expecting a small room for some reason, but it was humongous! there was a huge dance floor and a spacious stage for the live band that was playing (they had just finished up “springsteen” by eric church, one of my favorites!). it’s the kind of place where you come to just have a good ‘ole time, and you can bet that southern college kids know how to do just that. but one of the best moments? 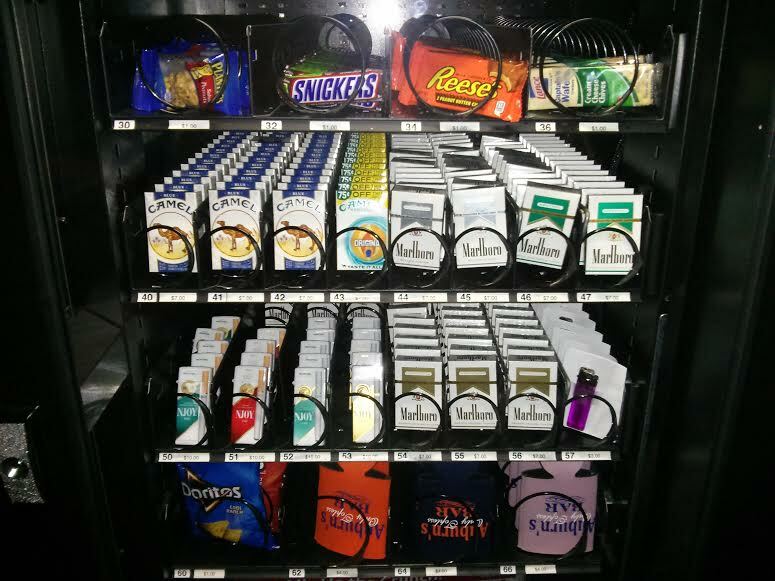 it was when we were just walking out of the boom boom room and saw this: a vending machine with not only traditional snacks and candies, but cigarettes and mints and koozies, too. what more could you want!? we were getting the late night munchies, so after catching a cab back to the hotel, we drove around town trying to find any fast food restaurant that might be open this late in the evening. mcdonald’s? nope. steak’n’shake? unfortunately, not. checkers?! no luck. so, we took a last chance, we took a last chance on taco bell, and it was open! we managed to order about thirty dollars worth of food, and then we so politely ate every single bite. 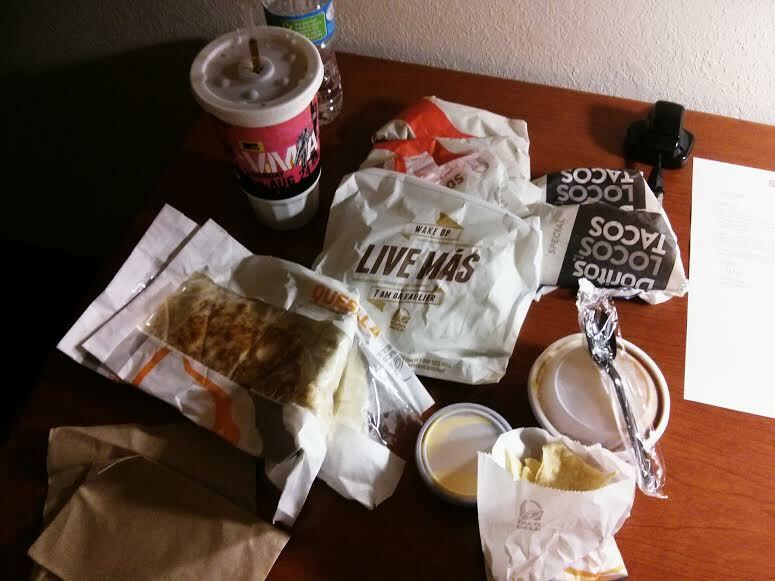 i confess right now, to all of you, that taco bell is some of the best late-night food out there. we slept quite soundly that night/morning and woke to rumbling stomachs. more food! clark had made reservations for us at the hound, so we packed up and headed in that direction. clark and i had been here last fall when i visited, and upon arrival, i remembered how much i had liked it that first time. we were a little early for our table, so we squeezed through the tables to the mama mocha coffee emporium that is connected to the hound. after walking in and adjusting to the bright sunshine pouring in through the windows, i was giddy with delight. this place was so cute! it was industrious and honest and simple. clark was smiling as he asked, “do you like it, kels?” of course i did! it’s the kind of coffee shop that i wish was were more prevalent in atlanta. kyle & kari & clark. the baristas kindly welcomed us and got to making our drinks. clark had iced coffee, kari had a hazelnut latte, and i had my café au lait. kyle had a pot of french press once we got to the table, and i think it’s safe to say that we all really enjoyed our coffees. i couldn’t help but peruse the merchandise stand before we left to eat, and to no surprise, i ended up with a souvenir to take home with me. although the actual mug itself is your standard mason jar, it’s the beautifully crafted leather holder that makes it so special. the holder is courtesy of loyal stricklin, a leather goods company based in opelika, a city just east of auburn. the quality is impeccable, and the detailing and stamping is quite stunning. i was thrilled to drink my fancy café au lait with it, and i have loved using it here at home as well. our table was ready, and we were ready to eat. we didn’t waste much time with the menu and nearly ordered right as our waiter brought us our water glasses. the menu here is short and sweet, and that’s just the intention of the hound. 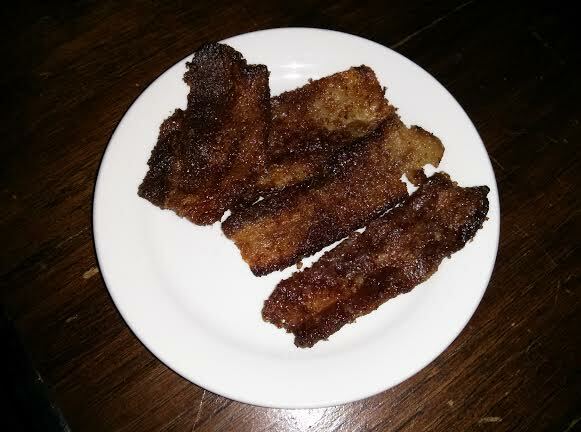 we started out with an order of the pig candy per mallory’s recommendation, and it was a sweet treat to start the meal. kyle described its taste as “meaty cinnamon toast crunch.” and you know? i don’t think he’s too far off. i only wish those little slices were bigger, much bigger! you can never have enough bacon. 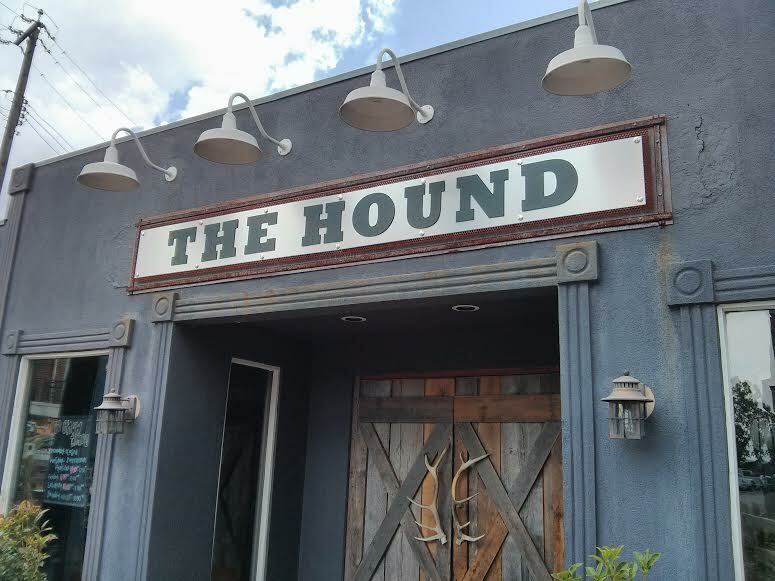 the hound is a great spot for a couple’s brunch or a family’s meal. they’ve got smaller tables for a more intimate setting and long tabletops and benches for a crowd. even though it’s a large space, it isn’t too loud, which we all know i certainly appreciate. the four of us had a great time discussing the future and the things to come, while also telling childhood tales of mischief and imagination. such a good thing, to have family so near. our meals arrived before not too long, and then our table got quiet. kari ate nearly all of the granola french toast she had, and i don’t blame her because it looked quite savory. kyle was impressed by the redneck benedict. clark really liked the spicy and flavorful juevos houndcheros. i loved the biscuits and gravy. the biscuits were clearly homemade, the gravy was thick, and the sausage was a little spicy and mouthwatering. i could have used a spoon to lick up that last little bit i left in the bowl! we paid our checks, washed up, and moseyed, quite slowly, out to the cars. we were full! it was the perfect ending to a perfect weekend with family, and i could not be more thankful that we are all so close. i count myself quite lucky to be surrounded by folks such as these.